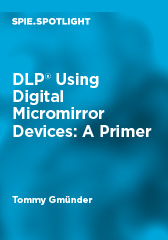 Digital Light Processing (DLP) is a multipurpose, robust, modern, and easily accessible optical technology that uses Digital Micromirror Devices (DMDs), which reflect light pixelwise from a light source to a target. This Spotlight describes how to set up and implement DLP in various applications, such as training kits, reference designs, test equipment, and how to get the quickest and most efficient learning experience. The reason for writing this Spotlight is the lack of qualified hands-on documentation about DLP technology. It summarizes all of the information from different sources and the author's developer experience in one text so that readers need only one reference for help with and information about their design. This Spotlight describes how to use a DLP implementation for many application areas, training kits, reference designs, test equipment, setup, and the best approach to get the quickest and most efficient learning experience. Each chapter is formulated with the idea to point the attention of the reader to possible error sources, which should be avoided as early as possible. After reading this book, readers should be able to draft an elementary DLP�-based projector system and organize its parts with the desired properties from a chosen supplier. Target audiences are technicians and engineers without any experience or previous knowledge who are interested in using DLP for applications such as computer lithography, computer-to-screen/computer-to-plate exposure, 3-D printing, optical projection, and spectral analysis. Any substantial feedback is welcome. The same applies for concretely designing support or delivery for system parts such as light sources, optical engines, objectives, and so on.